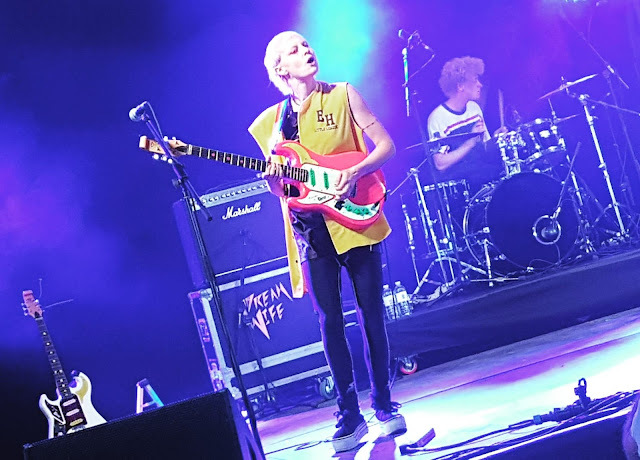 Some of the best guitar new bands coupled with rain, wind and sunny spells kept festival goers entertained at this year's Reading Festival. 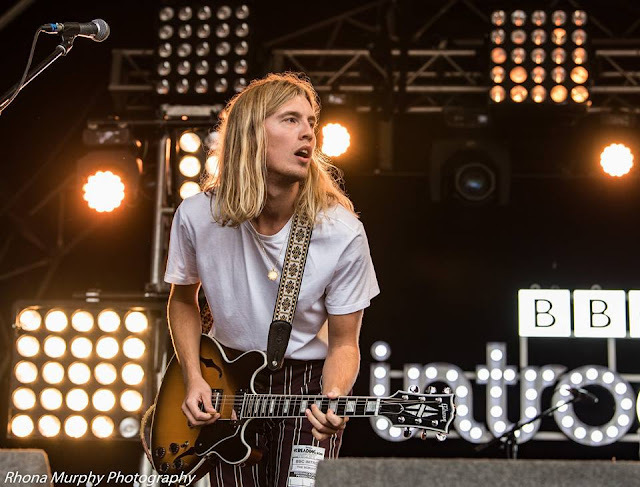 As this year saw a line-up less packed with big name headliners even more attention was directed towards new and emerging bands and the BBC Music Introducing and the Festival Republic Stages enjoyed a fair share of Reading Festival's highlights. 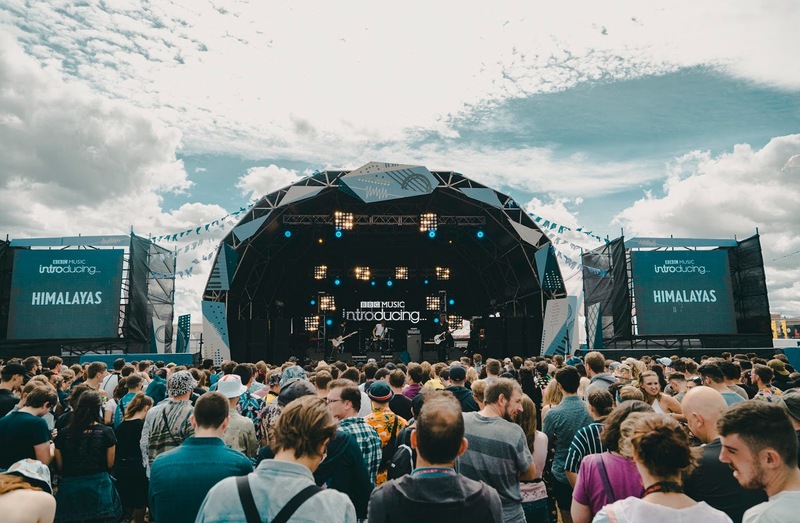 BBC Music Introducing's unrivalled status as a suitable platform for new music continues and this is reflected at Reading and Leeds. Since its launch in 2007 the BBC's talent spotting arm has grown and its position and influence has been immense. 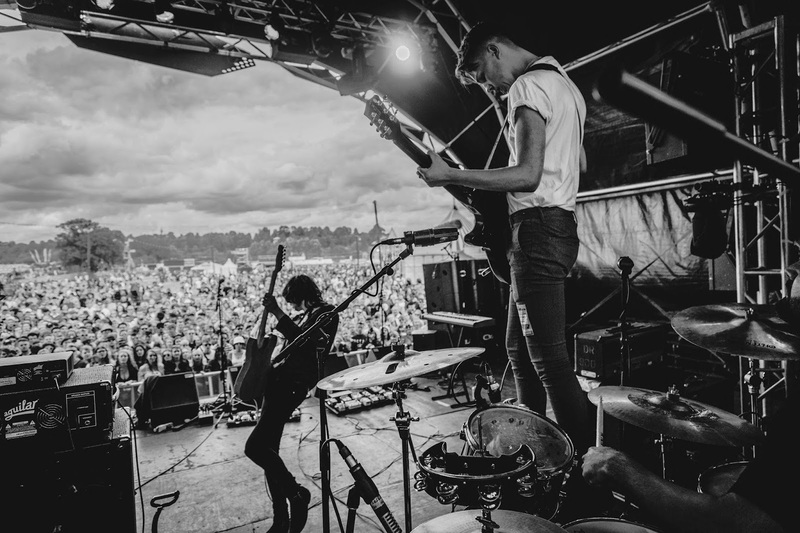 With some activity abroad in the States and Canada as well as numerous franchise stages at festivals around the UK, it continues to be a main box to tick off for new bands and artists. Like some other big festivals Reading and Leeds Festivals have been at the receiving of criticism for not presenting and supporting female headliners and not hosting an equal number of female artists across all stages. However credible efforts at addressing this point and to present a more diverse line-up are clearly in place. The improvements inspire and make a difference to the overarching festival experience. Reading collaborates with Safe Gigs For Women, The Samaritans, and some medical teams to deliver a healthy weekend. Safe Gigs for Women is an initiative established by regular gig goers with the aim of creating a safe environment for women at music events. Although summer festival fashion trends at Reading Festival have not changed much there is still a sense that some things are definitely being reinvented. What has become obligatory festival glitter for face and body is now available in a wider range. Its demand for instant imagination or sprinkle application, sees no defined creative limits; the more creative the better, it is as simple as that. Matching the glitter trend is another festival classic; the short, torn denim shorts and fishnet tights never seem to go out of fashion at summer festivals. Recently referred to as “Hotter than Hell” on a BBC TV programme, pop singer-songwriter and model Dua Lipa was the most streamed UK artist of 2017 and is widely regarded as an ambassador for female empowerment in mainstream music, on a national as well as international scale. At Reading she has worked her way up the main stage bill and is performing a complete set. Accompanied by a full band, backing singers and dancers, she delivers an entertaining thought-provoking, choreographed show in front of a busy crowd on the main stage. Dressed in long yellow and black tartan bra, multi-coloured track suit trousers and white trainers, there is plenty of energy, pace and inspiration to take from her set. A glance at the line-up shows that more female artists and musicians are represented across all stages this year than ever before. One of the acts performing on the Festival Republic Stage on Friday evening is indie pop punk three piece Dream Wife. The band have been growing their fanbase in the past year and they have built a strong reputation on the recorded and live music circuit. Known for their charming, sparkly, glitter endorsing, fun-loving, and above all, dreamy live shows, their set is exactly what is needed on an evening dominated by heavy rain and wind and for all its colour, light, good vibes they bring to their set, there is a sense that they are in fact the real opening act at this year’s Reading Festival. Welsh music is enjoying a very strong position in the UK just now and this is reflected here at Reading. With Cardiff’s Himalayas experiencing their red and yellow debut on the BBC Music Introducing Stage, Pretty Vicious playing the Festival Republic Stage early afternoon on Saturday and North Wales’ The Joy Formidable performing on the main stage on day three, Welsh music is evidently alive with each band delivering a triumphant set. 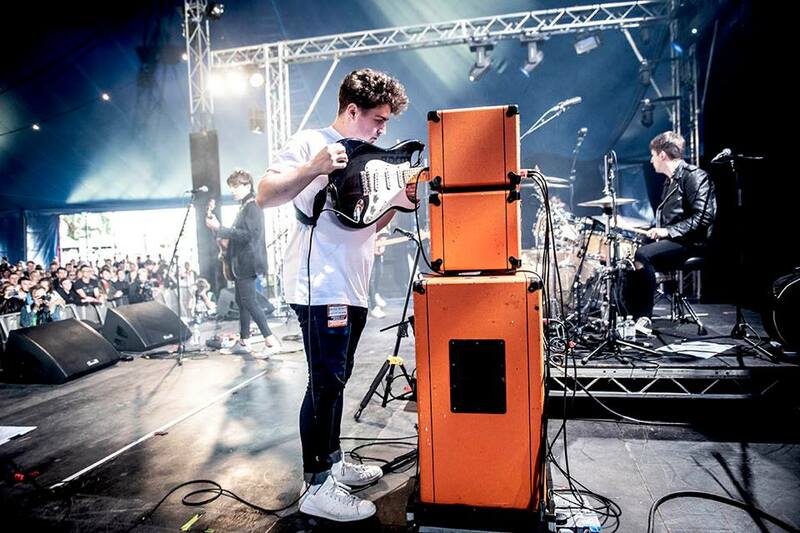 On at the BBC Music Introducing Stage at Friday at midday, a massive crowd has turned up to witness what must be the Himalayas' most career defining moment to date and there has been quite a few. Today is a testament to the sort of year they are celebrating as it highlights where they are at right now. Having just announced that Thank God I’m Not You has reached over 7 million streams on Spotify, the indie guitar wonders are already achieving what some established bands rarely go on to achieve. The band are continuing to establish their position and build a name for themselves. The crowd consists of a genuine range of music lovers and a large number sings the lyrics of Thank God I'm Not You and Sigh of A Hurricane straight back to Himalayas. This is no doubt one of the biggest 25-minute sets they are ever going to experience. The atmosphere is full of excitement and raw energy, bouncing and alternating between the band and the audience. A number of Welsh flags are out, mosh pits are forming just before Heaven Knows begins and the band play with more energy than ever before. By the end of the set the crowd number must been close to three thousand. It is a confident performance clearly showing the influence of their recent live outings; all the festivals and the Kaiser Chiefs support sets. 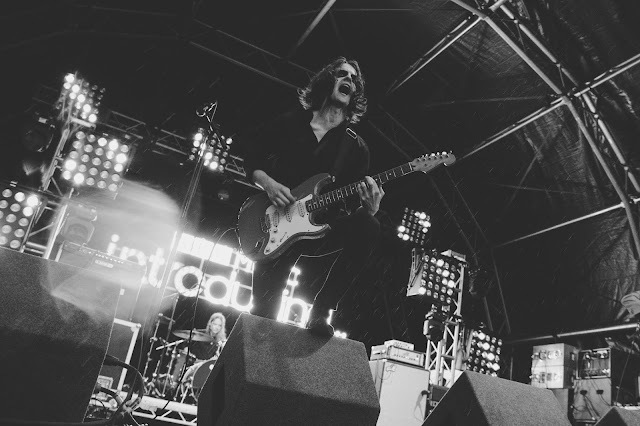 Later that day, headlining and closing the BBC Music Introducing Stage on Friday evening are one of the best and most talked about guitar bands this year, the Manchester based three piece The Blinders. The trio delivered a stunning Steve Lamacq session at Maida Vale for BBC Radio 6 Music in April and they are about to release their debut, the much anticipated album Columbia. Commencing their set with Gotta Get Through really sets the tone and tempo for the rest of the set, it is not just a great tune, it has plenty of layers. As usual Thomas Haywood, Matt Neale and Charlie McGough all work exceptionally hard and tonight is by no means an exception. Conditions of heavy rain and a modest crowd makes the band work even harder and the charismatic, high powered three piece gives it all they have got as they engage the crowd and their fans with songs such as Brutus and Brave New World. The Blinders remain one of the most fascinating new bands around, they are already achieving fabulous things and hopefully their Reading and Leeds Festival appearances only signify the beginning of their artistic journey. Following recent successful Stateside shows in New York and Nashville Pretty Vicious really did kick off this year in style when they announced they had signed a worldwide record deal with Big Machine/John Varvatos Records. There is no doubt things have been revived and the band are commencing a new chapter in their career. Seemingly rushing through their set at umpteen miles an hour, fast paced, there is plenty of high energy and a definite sense that they are moved and really appreciate the support they are getting from the crowd, comprising not only fans but also people who are just interested in the authentic rockers from Merthyr Tydfil. The set is a mix of new and established older songs and band’s recent single“Move” goes down well without seeming new to the set. Yet at the same time, nothing can equal the reaction Pretty Vicious get when the intro to Cave Song is heard, for now it still is their main anthem, and everyone there just loves their set. Some Welsh flags are out and there is moshing, jumping and chanting. Despite being short, it is a very strong set. Super-tight as usual it shows that Pretty Vicious still are one of the best and most authentic young guitar bands to come out of Wales. Given the fact that the tent is totally packed there is little doubt Reading and Leeds are suitable places for the band to maintain their reputation in the UK whilst continuing to build their career in the States and other parts of the world, which they already have seen good chunks of. Taking to the BBC Music Introducing stage late afternoon on Sunday are Bedford's The Scruff. Following a really great year, the band are definitely right on the cusp of taking things to the next level. They have a number of good tunes, there is a presence on stage and plenty of confidence. Their set at Reading makes a lasting impression. Most of the songs have tempo and are upbeat but the song Her offers a contrast to that with its subtlety and sensitivity. The boys can definitely write tunes and are able to transform the quality of their songs into their live sets. Elsewhere, a completely different type of action is about to unfold in the Radio 1 tent where Slaves are due to go on Stage. Widely regarded as a return to the duo's DIY ethos and raw punk sound, the release of their third album Acts of Fear and Love is a strong testament to what they are capable of delivering. 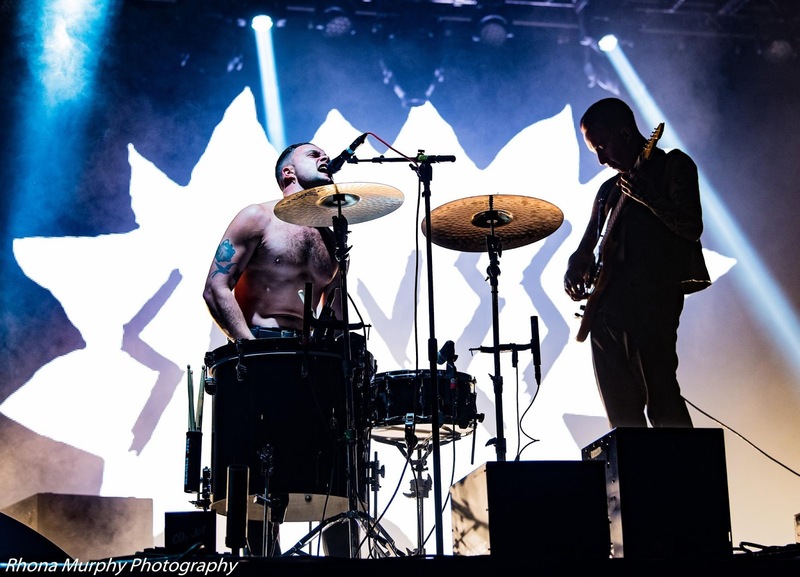 Slaves' set at Reading supports and complements the success of the recent album release. During their instant takeover of Reading's Radio 1 stage on Sunday evening, the duo do not waste a much as a nano second to make us aware who is in charge. Completely and utterly uncompromising, Issac and Laurie demonstrate how much they mean it. Primarily taken from their current album release, tonight's setlist and live performance is a reflection of where they are just now; they are full of raw, explosive energy, sweaty and straight in your face attitude. There is on overriding feeling of being taken over by the sort of powerhouse Slaves are. Once you are in, there is no way out. This is a good thing, it is where every member of their crowd wants to be right now. By continuing to offer some of the biggest and new names in music, the Reading Festival is more nuanced than it ever has been. Whilst presenting a wide range of music across all stages, it continues to deliver one of the most consistent UK festival experiences with high quality acts it places music entertainment and enjoyment right at the top of its agenda. The prospect of seeing what Reading and Leeds Festivals can offer in 2019 is exciting, will the line-up be closer to 2017 than 2018? Will the festivals offer a wider range of smaller acts in order to allow more light to shine on new music or will it be more a case of focusing the lineup around huge names? That remains to be the big question and there are arguments for and against both of them.